Palestinian President Mahmoud Abbas told a group of Israeli legislators who met him today in his office in Ramallah that President Trump's senior adviser Jared Kushner and U.S. special envoy Jason Greenblatt asked him in one of their meetings if he supports forming a Palestinian-Jordanian confederacy as part of a solution to the Israeli-Palestinian conflict. Why it matters: Most of the details about the talks Kushner and Greenblatt had with the Israelis and the Palestinians over the last 18 months regarding their peace plan have never leaked. This is the first time any of the players in the region has mentioned that the U.S. has explored the possibility of a Palestinian-Jordanian confederacy. This idea hasn't been on the table in Middle East peace talks in the last 25 years. 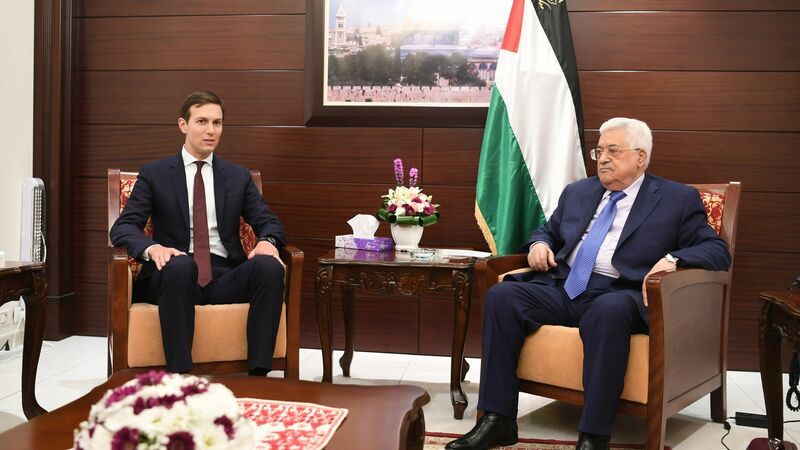 Two people who attended the meeting and took notes told me Abbas said he told Kushner and Greenblatt he would agree to a trilateral confederacy comprised of Israel, Jordan and Palestine. "I asked them if the Israelis would agree to such a confederacy but they said they didn't know," Abbas told the Israeli members of Knesset in the meeting today. Abbas said that in all four of his meetings with Trump, the president had told him he supports a two-state solution. Abbas said he thinks Trump might have changed his mind about this. Abbas also said the current U.S. policy is hostile towards the Palestinians and closes any possibility to make progress in the peace process. He stressed that he is against the upcoming White House peace plan. Abbas criticized the Trump administration's decision to stop funding the United Nations Relief and Works Agency for Palestine Refugees in the Near East (UNRWA), and called the move disappointing and dangerous, adding that he has always said that the return of millions of Palestinian refugees will destroy Israel and he does not want to destroy Israel but live side-by-side with it. Abbas said a formula can be found that will not harm Israel but will give provide solution for the refugees. "The Arab peace initiative talks about an agreed upon solution to the refugee issue," he said.